Graduates hold themselves accountable for their education by making personal choices for the benefit of themselves and others. They set goals, manage resources, and create and implement their own learning plans. Graduates have a growth mindset — they seek challenges, grow from setbacks, and purposefully connect the things they learn to their own lives. Self-directed students are persistent, resilient and able to adapt to changing circumstances. 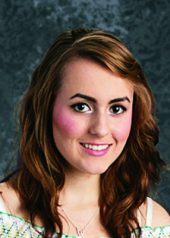 Andreea Musteata, Class of 2016, talks about how her self-direction skills flourished at Tech Valley High School.